Top Hackintosh news: Mac OS X 10.6.2 is available, and it does not work with Intel Atom-based netbooks (and presumably the few Atom-based desktops as well). Although no version of OS X has ever supported non-Apple hardware, netbooks with Atom processors worked through version 10.6.1. While some websites claim that Apple has dropped support for Atom, it should more precisely be said that Apple deliberately coded 10.6.2 so it would not work with Atom-based computers. Dell Adamo XPS: World's Thinnest Laptop at 0.4"
"Well, looks like I was right, again. The netbook forums are now blowing up with problems of 10.6.2 instant rebooting their Atom based netbooks. My sources tell me that every time a netbook user installs 10.6.2 an Apple employee gets their wings...."
"Intel Atom support is confirmed to be missing in the final release of 10.6.2, citing multiple prominent Hackintosh sources. "Apple's latest update for Snow Leopard has broken support for Intel's Atom processor line. Mac OS X 10.6.2 was released Monday afternoon, and was Apple's second major update for Snow Leopard." "VESA - the organisation overseeing DisplayPort - has added Apple's compact version of the digital monitor connector to its specification sheet. "Apple introduced its mini DisplayPort connector in 2008, rolling them out with the first metal MacBook, later renamed the 13in MacBook Pro." "Decisions, decisions. When it comes time to buy a new computer, it can be tough to make a decision. There's the processor speed, longevity of the product and, most importantly, the price. So how do you choose between a MacBook and a MacBook Pro? Here's how we break it down." Link: MacBook vs. MacBook Pro: Which Should You Buy? "Tosh does have a 2-platter 2.5-inch drive offering 640 GB with a 528.5 Gbit/sq in areal density. In September it announced a single platter 160 GB 1.8-inch drive with a lower areal density level of 467 Gbit/sq in: the MK1634GAL...."
"Continuing on with our series of instructional videos, this week we take a look at another common upgrade for the 2009 MacBook putting in a new hard drive. You can always use more storage space, so adding a new hard drive is something you may want to consider if you're feeling the pinch of too little room. "Fortunately, unlike with the new iMacs, upgrading the hard drive on the new MacBooks is easy to do. All you need are the right materials and the knowledge of how to perform the upgrade. "First, you ll need a compatible hard drive. "You ll also want to have the appropriate tools in this case, a #00 Phillips screwdriver and a Torx T6 screwdriver (both of which are available in the NewerTech 11-piece Toolkit). "If you plan on transferring the data from your old drive, you ll need some way of accessing it, either via a docking device like the NewerTech Voyager Q or S2, an external drive enclosure, or a simple USB adapter, such as the NewerTech Universal Drive Adapter. Personally, I d suggest the enclosure, as it lets you continue to use the old drive for other purposes. "Quanta Computer is estimated to have shipped about four million notebooks in October, while Compal Electronics shipped 4.4-4.6 million units, Wistron 2.6 million units and Inventec 1.8-2 million units, according to market watchers. "Benefiting from Hewlett-Packard (HP), Apple and Sony's notebook orders as well as Acer's new 11.6-inch tablet PC orders, Quanta's shipments in October are estimate to have grown about 10% on month from 3.6 million units in September." Computerworld's Michael DeAgonia says that if you're looking for the performance of a MacBook Pro without the Pro price, you'll like Apple's newly updated MacBook - still priced at $999 - or $200 less than the 13-in. aluminum-clad MacBook Pro. However compared to the model it replaces, Apple's latest entry-level portable delivers updated architecture, a higher-capacity hard drive and a higher-quality screen as well as the marquee "unibody" redesigned plastic housing in the shiny white plastic that's been the hallmark of the line for years, superceding the previous model's iBook carryover the boxy look with flowing lines, swooping angles and precision component and panel fits. PR: Ready to hit the reset button on personal computing? A new kind of computer company, litl (litl.com), has unveiled its webbook computer and operating system a completely new and simple way for everyone in the family to enjoy online photos and all the web has to offer. The litl webbook, an Internet computer for the home, blends the engaging content and social interactivity of the web with high-quality TV-like viewing of online photos and other digital content. As everything from music and photos to email and social networking moves online, it's clear that the web is transforming personal computing. And yet, most homes are still using computers and software based on thinking from more than 30 years ago. explained litl's founder and CEO John Chuang. We knew that to really meet the needs of home users from kids to parents and grandparents we needed to design an entirely new system that would make the web engaging, entertaining and fun. According to the Pew Internet & American Life Project, 69% of Americans online use webmail services, store photos and other data online, or use software programs such as word processing applications whose functionality is located on the web. The web's convenience and flexibility are driving these users to adopt online services: 51% cited easy and convenient , 41% cite ease of access from any computer , and 39% cited ease of sharing information as major reasons. A third of this group also cited that their data is better protected from computer failure." When not used as a conventional laptop, the litl webbook's 12 screen and keyboard flip around its patented hinge so the computer can stand upright like an easel. With its screen exposed, the litl webbook is now ideal for passive or lean back web activity like enjoying photos, listening to music, or consuming news, weather, and other web content. The litl was designed to enhance home web use like this with a bright screen featuring a revolutionary 178-degree viewing cone . Most traditional computers are designed for a single user, but the litl's unique screen technology allows a group of people to clearly view the screen at the same time. For an even more social experience, the litl webbook also offers plug-and-play connectivity to large screen, high definition televisions by way of a convenient HDMI (High-Definition Multimedia Interface) output port. An innovative hinge-mounted scroll wheel for changing web channels and an optional remote control further enhance this TV-like experience. The litl webbook makes it easy to connect and stay in touch with friends and family. Because of its unique design, content from one litl to another is automatically synched, making content available ubiquitously. This feature allows users to instantly access and share content any time, any way, and any place they desire. For example, photos of the grandkids on a litl in one house can be instantly shared with grandma using a litl at her house%even viewed instantly on her TV, without ever sending an email. In addition, with its specially designed user interface and browser, the litl webbook is always on, with no need to log in to an operating system or launch a browser. The litl has an interface that is extremely easy to use, eliminating cumbersome menus, folders and icons. The litl webbook is available immediately online at litl.com. The price for the litl is $699, with an optional remote control for $19. The litl webbook includes a free two-year unconditional "satisfaction guaranteed or your money refunded" warranty%double the industry standard of one year and significantly more consumer-friendly. Customer support is always available from litl's friendly customer service team, via email at asklitl@litl.com, Twitter at twitter.com/asklitl, or phone at 800.878.0900. Based in Boston, litl is a new kind of computer company. The company was founded to make the web more enjoyable and entertaining for everyday consumers. Learn more at litl.com. Weighs a mere 3.2 lb. Prices start at $1,799, or as much as a high-end MacBook Air with a 2.13 GHz Core 2 Duo and five hours of life on its built-in battery. Height ranges from 9.7mm to 10.3mm. System Memory: Significant system memory may be used to support graphics, depending on system memory size and other factors. 4 GB or Greater System Memory Capability: A 64-bit operating system is required to support 4 GB or more of system memory. Based on lab testing. Varies by configuration, operating conditions and other factors. Maximum battery capacity decreases with time and use. PR: High-tech manufacturer Axiotron has reduced the manufacturer's suggested retail price of the Modbook to $899 (for Modbooks built with a customer-supplied Apple MacBook base system) and $1,799 (for complete Modbooks that include a dealer-supplied 2.13 GHz Apple MacBook base system). A $200 holiday discount is available on all Modbook purchases through December 31, 2009. When the holiday discount is applied, the MSRP for Modbooks built with a customer-supplied base system is only $699 and the MSRP for complete Modbooks that include a dealer-supplied 2.13 GHz base system is only $1,599. Praised by reviewers for its portability and ease-of-use, the Modbook seamlessly integrates Axiotron's tablet hardware and software technology, a state-of-the-art Wacom Penabled digitizer and an Apple MacBook base system. The result is an award-winning, Mac-based tablet computer that's ideal for creative professionals, students and general users. Axiotron's Modbook is built with customer-supplied MacBooks or with clearance-priced MacBooks supplied by Axiotron's dealers. Most MacBooks released since 2006 are eligible for conversion into Modbooks. The aluminum unibody MacBook models (released in late 2008) and the polycarbonate unibody MacBook models (recently released) are not eligible for conversion. The Modbook supports both the Mac OS X Leopard operating system and the latest version of Mac OS X, Snow Leopard. Every Modbook comes with a 90-day Modcare warranty on the entire system (including the MacBook base system, whose warranty is voided during the Modbook conversion). Extended warranty options for one or more years are available through participating Axiotron sales partners. Servicing and repair of the Modbook are provided by Axiotron's service provider network. Complete Modbook systems are available at prices below the holiday MSRP of $1,599. Customers should check with individual dealers for details on the many value-priced offers available. "We're excited to offer the Modbook to customers at a much lower price. The Modbook remains the fastest slate tablet computer available, and the only Mac-based tablet," said Axiotron CEO Andreas E. Haas, "It's an especially compelling opportunity for students and other customers looking for more affordable Modbook options." Axiotron today also announced that the Modbook Pro tablet computer is planned for release at the end of the second quarter of 2010. Unveiled during the Macworld Expo 2009, the Modbook Pro's distinctive multi-body abstraction design encapsulates an Apple MacBook Pro base system within its sleek, multipart enclosure and employs Axiotron's cutting-edge SynergyTouch pen-with-touch capabilities. Axiotron is currently reevaluating the market potential of SynergyTouch hardware/software upgrades for existing Modbooks. PR: Write, Draw, and Sketch on the world's only Mac-based tablet. Runs both Mac OS X and Windows with Mac OS "Snow Leopard" 10.6 included and preinstalled. Other World Computing (OWC) announced a $500 price reduction and expanded options on the Axiotron Modbook, the world's only Mac-based tablet computer that lets users draw and write directly on the screen. OWC, as a fully certified Axiotron Authorized System Manufacturer (AASM), has also reduced the price of its MacBook to Modbook Modservice conversion by 40%. Custom configured 13.3" Modbook tablets now start from $1,599 with standard Intel Core 2 Duo 2.13 GHz processor, 2 GB of memory, 160 GB internal hard drive, an 8X Dual-Layer SuperDrive, Airport Extreme 802.11b/g/n wireless, Bluetooth, and Mac OS 10.6.x "Snow Leopard" installed. Exclusively for OWC customers, a built in WAAS enabled GPS is also included for no additional cost. Customers may also custom configure their Modbook with up to 6 GB of memory, Solid State Drives (SSD) up to 256 GB, and hard disk drives for up 1.28 TB (1280 GB) of total internal storage capacity and have it shipped within 48 hours. Owners of an existing Apple MacBook 13" (with FireWire 400) can choose Modservice and have their MacBook converted by OWC into a fully featured Modbook for $649.99 - now 40% less than the previous conversion price. The turnkey service includes FedEx shipping to and from OWC in a protective shipping box and exclusively for OWC customers, a built-in WAAS enabled GPS at no additional cost. Conversion turnaround is 48 hours or less and customers may also select options for memory, hard drive, SSD, and optical drive upgrades for OWC to install during the Modservice conversion. Both new Modbook and Modservice conversion offerings are backed by a 90 Day Axiotron Hardware limited warranty, which can be optionally extended to up to a 3-year OWC Warranty starting from $129.00. The Extended Warranty covers the original MacBook components; any customer-selected upgrades installed by OWC at the time of modification, and the tablet components. PR: AT&T has announced a new 3G LaptopConnect device from Sierra Wireless, the AT&T USBConnect Lightning, will launch in retail stores, business channels, and online nationwide beginning November 22. The Lightning delivers enhanced mobile broadband performance on the nation's fastest 3G network for quick and easy Internet access while on the go. It will be compatible with AT&T's High Speed Packet Access (HSPA) 7.2 technology, which provides a considerable speed boost to the 3G mobile broadband network where deployed. For customers with the need to access email, the Internet, and business applications from their laptop while away from home or work, the Lightning offers the perfect solution. AT&T 3G mobile broadband speed built into a small and elegant design that includes an illuminated face plate and USB hinge for use with different laptop designs provides an ideal mix of form and function. Connecting in more places is now even easier with AT&T's global network compatibility and access to AT&T's more than 20,000 WiFi hotspots. "The Lightning is a high-performing device compatible with our latest HSPA technology," said Michael Woodward, vice president, Mobile Phone Portfolio, AT&T Mobility and Consumer Markets. "As we continue our 3G network evolution, we are building a solid portfolio of HSPA 7.2 devices to meet the future needs of our customers." With the upgrade to HSPA 7.2 technology, AT&T continues investments to deliver the nation's fastest 3G network. AT&T plans for initial deployment of HSPA 7.2 in Charlotte, Chicago, Dallas, Houston, Los Angeles and Miami by the end of the year. The company plans to deploy HSPA 7.2 in 25 of the nation's 30 largest markets by the end of the second quarter of 2010, and to reach about 90 percent of its existing 3G network footprint with HSPA 7.2 by the end of 2011. "The USBConnect Lightning offers an innovative, eye-catching lighted design with a swivel hinge for flexible use in horizontally or vertically oriented USB ports, and we are pleased to offer it exclusively to AT&T customers as the company deploys HSPA 7.2 coverage," said Dan Schieler, senior vice president of Worldwide Sales for Sierra Wireless. "People continue to expand their use of mobile broadband in their everyday routines wherever they are, and the evolution of the AT&T 3G network and devices like the USBConnect Lightning provide them with the flexibility and freedom to do so." The Lightning comes preloaded with AT&T Communication Manager (ACM) 7.0 software to help customers manage their connections. The newly revamped Communication Manager will automatically connect users to an AT&T Hot Spot at no cost on eligible rate plans when the application is running. Customers can also download the latest version of AT&T Communication Manager. ACM 7.0 is compatible with Microsoft Windows XP, Vista, and 7. Note: AT&T does not provide support for Mac OS-compatible connection software. You can find support information for this software on the device manufacturers' website. AT&T DataConnect plans offer consumer, small business, and enterprise subscribers access to the nation's fastest 3G mobile broadband network, along with access to more than 20,000 AT&T WiFi Hot Spots nationwide with eligible rate plans and WiFi equipped laptops. Options include a 200 MB plan option for a newly reduced price of $35 per month or a 5 GB plan for $60 per month. The Lightning will be available at no cost after a $100 mail-in rebate with a DataConnect Plan of at least $35 a month. Pay $99.99 after two year agreement and receive a $100 AT&T Promotion Card. The device will be sold at AT&T retail stores nationwide and online. AT&T imposes a Regulatory Cost Recovery Charge of up to $1.25 to help defray costs incurred in complying with obligations and charges imposed by State and Federal telecom regulations; State and Federal Universal Service charges; and surcharges for government assessments on AT&T. These fees are not taxes or government-required charges. 3G coverage is not available in all areas. Nation's largest WiFi network based on non-municipal company and owned and operated hotspots and an 802.11 b/g enabled device. Coverage not available in all areas. Other terms and conditions apply. AT&T Promotion Card: Price before AT&T Promotion Card & with 2 year contract is $99.99. Allow 60 days for fulfillment. Card valid for 120 days wherever major credit cards accepted. May be used to pay wireless bill. Not redeemable for cash and cannot be used at ATMs or gas pumps. Some restrictions and other charges apply. See terms at store or at att.com/wirelessrebate. You must be customer for 30 consecutive days to receive Promotion Card. Offer expires December 25, 2009. Limited-time offer. Other conditions & restrictions apply. See contract & rate plan brochure for details. Subscriber must live & have a mailing addr. within AT&T's owned wireless network coverage area. Up to $36 activ. fee applies. Equipment price & avail may vary by mrk & may not be available from independent retailers. Early Termination Fee: None if canceled in the first 30 days, but up to $35 restocking fee may apply to equipment returns; thereafter up to $175. Some agents impose add'l fees. Offnet Usage: If your mins of data use on other carrier's networks ("offnet usage") during any month exceeds your offnet usage allowance, AT&T may at its option terminate your svc, deny your contd use of other carriers' coverage, or change your plan to one imposing usage charges for offnet usage. Your data offnet usage allowance is the lesser of 24 MB or 20% of the KB incl'd with your plan). DataConnect Plan is not unlimited and substantial charges may be incurred if included allowance is exceeded. Sales tax calculated based on price of unactivated equipment. PR: This USB hub is in the shape of a red Cross Tombstone and it will add additional ports to any computer. 480 MBps of digital connectivity in a simple four-port USB 2.0 hub sits on your desk. Plug in your flash drives, scanners, and other devices. 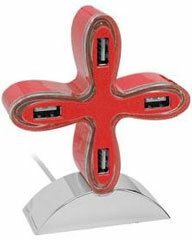 Designed with red cross-shaped, the hub has a attractive look, can be a wonderful decoration for your PC or Mac. This Cross-shaped 4 Port Hub is powered by the standard USB port via the USB cable attached, and features 1 upstream and 4 downstream USB ports. The USB 2.0 interface supports a theoretical data transfer rate up to 480 Mbps. This Laptop 4 Port USB Hub supports 4 bus-powered USB hub controller with embedded proprietary processor and 4 bus-powered downstream ports. No driver installation is required. Desktop USB 2.0 Hub supports self-powered mode and hot plug and play. 500mA each port is reliable at up to 15 feet of transmission. USB cable length: ~49cm, 19.3"
Dimension: ~10.4(L) x 8.8(W) x 3.2(H)cm, ~4.1"(L) x 3.46"(W) x 1.26"
PR: Combine style and function with Latte - a slim, chic shoulder bag, designed to cushion your laptop as you carry it from anywhere to everywhere. Latte protects your laptop from the inside out. Internally it's surrounded with cushioned felt and high density padding; from the outside it's disguised in a sleek, contemporary shoulder bag. A zippered pocket has space for a wallet and phone, and other external pockets allow for cables, papers and essentials. 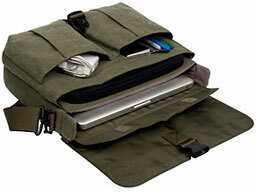 Suitable for most notebooks with screens up to 13.3"
Ample pockets for cables, adapters, etc. Latte comes in a small size and fits most laptops with 13" screens. Note: To clean this bag, a soft, damp cloth can be used. PR: The Scout Laptop Shoulder Bag is the perfect combination of style and function - a rugged and sophisticated multipurpose laptop shoulder bag that's perfect for work and play. Get back to basics with scout- one click of the heavy duty buckle gives you access to the laptop section (with a secure flap), your documents and folders, utility pockets for accessories and a secure zippered pocket for a wallet, mobile or iPod. Water resistant, light weight canvas gives scout a rugged look and feel and STM's new shoulder padding gives a comfortable carrying experience, even when the bag is full to the brim. Scout's laptop section is made from high density padding and cushioned felt lining, so your laptop is as secure inside the bag as you are wearing it. 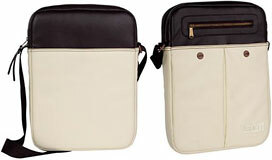 Designed to accommodate notebooks up to 15.5"
Large internal volume for books, folders, etc. Purchase Link: Currently available from Amazon.com for $69.99 shipped.